Whether you’re adding on a room, remodeling your home or you are overseeing a huge commercial building construction, you will probably find yourself looking at options for a cove base product. This may seem like a very small part of your project (and it very well may be), but the choices that you make can affect your budget and the overall appearance of the finished area. 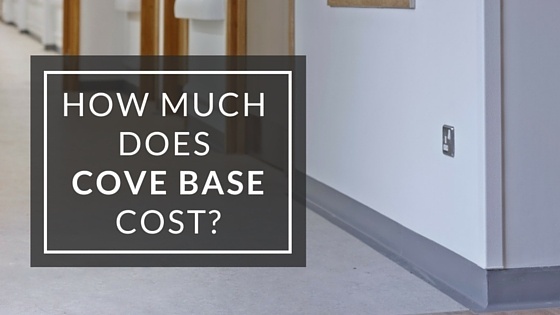 There are many factors that will determine the costs of your cove base product. I recommend having a budget in mind before you start shopping. This will help narrow down the finishes or materials to consider and which ones to avoid. Wood molding is most commonly used in residential settings. You can select from a multitude of colors (finishes) or buy them raw (unpainted or unfinished). Of course, the raw material will have a lower upfront cost, but might ultimately cost more overall when you consider the additional time and materials you will need before placing the wood molding on your wall. Wood molding comes in a wide array of sizes and shapes. A small “quarter round” type profile, will cost around $10-$15 per stick (usually around 8’ each). A more traditional wooden cove base that is 3 ½” wide will cost at least $35 per stick. Now, the cost of either the quarter round trim or full wooden molding will be slightly lower if you choose a raw profile. Again, remember to consider the cost of your additional time and materials. A wood molding can last for years and years if it is cleaned and maintained properly. In most commercial installations, including healthcare and educational settings, you would choose to use a traditional vinyl cove base. These are easily installed using a double-sided installation tape, or cartridge adhesive. Vinyl cove base is easily cleaned and come in a wide range of colors. Another benefit of vinyl cove base is that it easily conforms to irregularities in the wall and can be easily formed around corners. Pricing for a vinyl cove base can range from under $1.00 per foot to around $2.50 per foot. The costs usually depends on the quality of the product, the quantity purchased, the manufacturer, and sometimes the color you choose (if custom colors are available). The lifespan of vinyl cove base typically depends on the quality of product, the environment where it’s being used, and how maintenance and cleaning is performed. Generally, you can expect 5 years or more of use from a good vinyl cove base. Metal cove base generally comes at a higher price point. When you are looking for a luxury appearance and have the budget to accommodate the higher price tag, metal cove base is a good choice. The options for metal cove base finishes aren’t as abundant as they are for wood and vinyl cove bases. But, if you want a luxury look, have done your research, and are aware of the premium price, it might be right for your project. The cost of metal cove base generally ranges between $4.00 per foot and over $15.00 a foot for a good quality metal cove base. Metal cove base installation methods are similar to vinyl cove base, by using either a double-sided installation tape or a cartridge adhesive. You can expect many years of beauty from a metal cove base. One tip for sustaining the appearance of metal cove base - never use acid or alkaline detergents, abrasive products or materials, or solvents when cleaning the product. Once you have made the decision about which type of cove base to use for your project or new build, find several sources for the profiles and compare cost and quality. For wood trim, you can generally find a large selection at your local DIY or hardware store. There are also countless online sources for any of the types of cove base profiles that I’ve mentioned. Optimum Technologies distributes the Gradus brand of cove bases that are available in PVC (Vinyl) and metal.